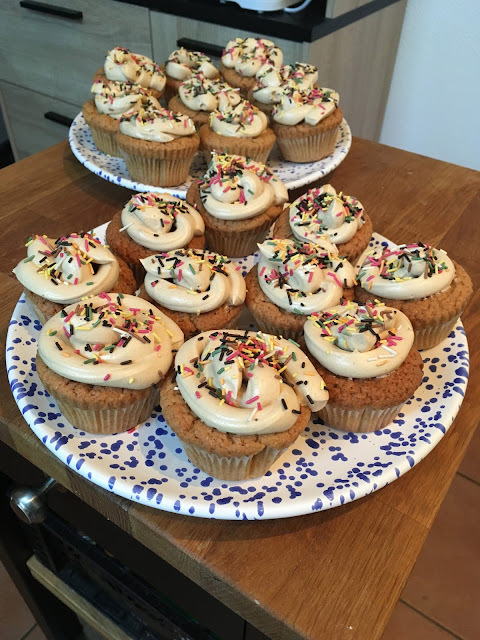 I took my love for cookie butter to the next level and made a dozen and a half cookie butter cupcakes for Alex's birthday. I found the recipe here (baking temp is 350F/175C) and they came out perfectly! I used a regular plastic bag to pipe on the frosting, so it kind of looks like...well...you know what, but they still tasted great. 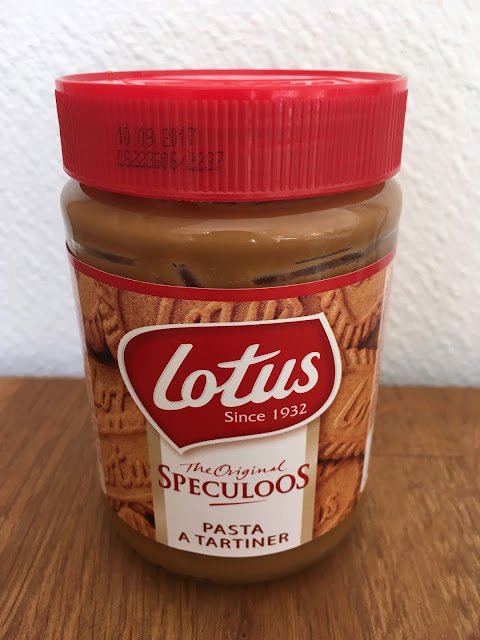 If you can find some cookie butter (also known as Biscoff or speculoos spread) I highly recommend making it a permanent member of your pantry! Let's start with the fun stuff: my new hobby! 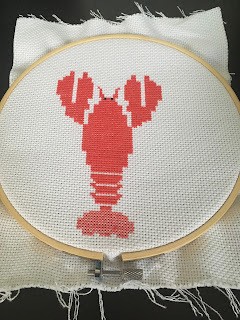 It's cross stitching! Much like ladies of yore, I have nothing but time on my small-but-nimble hands, with which I can sit and decoratively thread a needle in and out of fabric for hours at a time. When I found a little kit from DOIY Design at a gift shop in Lyon, I knew I had to try it out. Behold, my first cross stitch project! Meditation is still on my daily to-do list, but to be honest, it's not going great. I don't blame Habit Bull for not keeping me accountable, either; it's just surprisingly difficult to get myself to sit quietly and focus on my breath for 10 minutes every day. Which is dumb, cause really, but just like any other homework I give myself, I struggle to make myself do it. HOWEVER, I think the meditation has actually been paying off, even as infrequently as I do it. Why do I think this? Because I've had some progress in lucid dreaming lately, which is super exciting. Even though it's still a learning process, I have to believe that my work with meditation has helped open a doorway to my subconscious and increased my awareness, but clearly, I have a ways to go before I can fly to Norway and dance with a herd of reindeer underneath the Northern Lights. Or whatever I feel like doing when I finally break through. Guys! GUYS! Guess what I just found at the grocery store! It's COOKIE BUTTER - like peanut butter, but made of cookies. I'm serious. The first ingredient is Speculoos cookies. In other words, they take cookies, mash them up, mix them with more sugar and fat, and voilà! Spreadable cookies. Amazing. I'm sure that you've all been on the edge of your seats waiting to hear about the projects I started a couple weeks ago. Well, I thought I'd try to be a good blogger for a change, and present you with some timely updates. So as you can see here, the number went up and down - fascinating! The new app I'm using is called HabitBull, which is free, but does offer premium features (aka cost money) which are way beyond my needs. The free version lets you track 5 habits (which is probably more than I can try to instill in myself at one time anyway!) by setting both a daily goal, which is measured by either a yes/no or a number, and a streak goal, which is how many days in a row you want to do the new habit before you succeed. They recommend 66 days so that's my goal. We were in Berlin for the weekend, during which time I ignored the reminders and failed to meditate, so I had to start over with a zero day streak. It amazed me how much more difficult it was to stay focused today, after just 3 days without practicing. The thought "how much longer is there?" popped up in my mind several times, which hasn't happened since the first few days. It reminded me of dieting or exercising - it's so much harder to get "back on the wagon" than it is to start fresh with a new habit. Why is that? Psychology: The Truth Behind Your Behavior and How You Can Take Control of Your Life by Steve Blackman was a waste of time, money, and anticipation. It belongs on the "Do Not Read" list. Then again, it was only 99 cents, a true sign of top-notch quality in the publishing world. Keep my 99 cents, Steve, you earned it - you found an easy mark. I haven't gotten all the way through Lucid Dreaming: A Beginner's Guide to Becoming Conscious in Your Dreams by Charley Morley yet. After Part I, which focuses on how to become lucid, Part II starts to delve into what to do during lucid dreams, and I don't feel like I need to read about all the cool stuff I can't do yet. I did realize once that I was dreaming (hooray! Step 1! ), but when I tried to change the dream, it turned into a gray wall, like a screen locking up or static on the TV, and I couldn't go any further. I figured I still have some work to do becoming friends with my subconscious, so I've focused on meditation for the time being. I also started re-reading Lucid Dreaming, Plain and Simple by Robert Waggoner, another leading figure in the world of lucid dreaming. His book contains even more suggestions of how to become lucid than Charley's book; Charley, as a practicing Buddhist, teaches inner awareness and meditation as keystones of becoming lucid, while Robert offers many other techniques. Some of their techniques overlap, of course, and both of them recommend using lucid dreaming as a way to explore the self. (Robert's other book is Lucid Dreaming: Gateway to the Inner Self.) So my hunt for lucid dreams continues. Alex and I have been waiting to hear back from Canada on our visa application since we applied in mid-April. It has been a struggle to stay patient, as I'm sure you can imagine. We ordered a copy of our immigration file last month, and we just received it - it seems to say that we are approved, which is great news! However, we still haven't gotten our "Passport Request," which is the last step of the process before we can move. 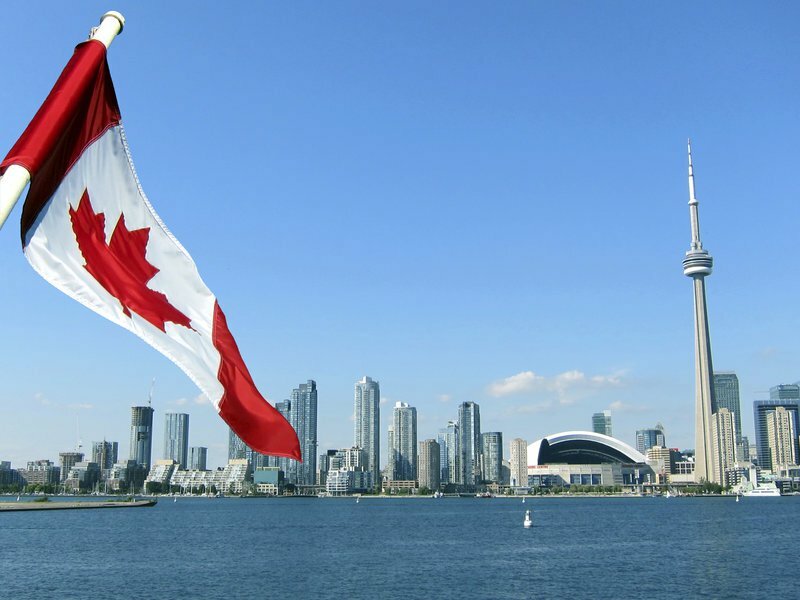 We expect to get it by mid-October, which is 6 months after our application and in line with Canada's average turnaround time for visa applications, but of course we're hoping to get it even sooner. We're already selling off our furniture in preparation, and we've gotten quotes on the cost of shipping Neko over. Finally, the long wait seems to be nearly over, and I'm ecstatic! The land of Terry Fox, the Gimli Glider, and Justin Trudeau...they've got it all! I haven't been posting much because it doesn't feel like I do very much, not much worth writing about at least. 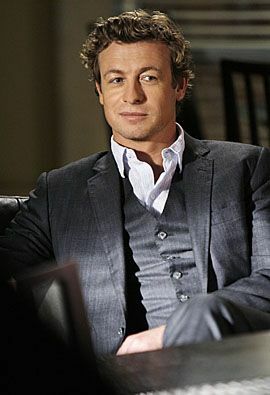 Sitting around my house in Villeurbanne streaming my way through all 7 seasons of The Mentalist doesn't provide much fodder for thoughtful reflection. However, I've been on somewhat of a reading kick lately, so I decided to put my latest musings out there. This is partly so I can hold myself accountable, but it might also trigger curiosity in one of you, which would be neat. Fringe-ology by Steve Volk: This was written by a journalist who goes out in search of the "truth" behind ideas on the fringe - UFOs, ghosts, near death experiences, lucid dreaming, etc. He skewers both believers and skeptics, arguing that the people on both sides of these phenomena engage in emotionally-driven arguments, which at best ignore, and at worst purposefully conceal, the existing evidence. I like his approach very much; he's open-minded but demands some kind of evidence, whether "explainable" or not. Now, I know that lucid dreaming is real, because I've done it. I haven't had personal experiences with the other topics though, so his even-handed treatment was intellectually satisfying, and the writing is high quality. I highly recommend this book if you are at all curious about "out-there"/paranormal/unexplained ideas and events. I blasted through it in a few days; a thoroughly enjoyable read. The Chaos Protocols by Gordon White: Most of you will shake your heads at this one, and that's fine. It's written by a blogger who lives in London, and it covers two topics: 1) how to perform magic spells and make otherworldly connections in order to improve your life, and 2) the economic downfall currently in progress vis-à-vis unsustainable debt loads, the shrinking middle class, and technologically-driven changes to the global economy. The half of the book that is an economic treatise is clearly his own worldview, and he makes a decent argument for it, although I loathe the James Altucher references. The magic itself I haven't tried yet; when I do, I'll be sure to let you know the results! Regardless of the efficacity of the magic, I found his ideas thought-provoking, and if nothing else, allowing myself to see the world and my place in it through a different lens was an interesting and useful exercise. Mr. White's blog, too, looks like a rabbit hole I could happily fall into for months. How to be Creative by Malcolm Hughes: This is a tiny (and cheap) e-book, with just 5 chapters, or "steps," to help you become more creative. Is it a vast oversimplification of how to trigger creativity? Yes, of course. But I wasn't looking for a different version of The Artist's Way - I wanted a quick and dirty reminder that I could pick up and read in a couple hours. Did it fit the bill? Yup. For $2.99 I feel satisfied. First, the importance of meditation. 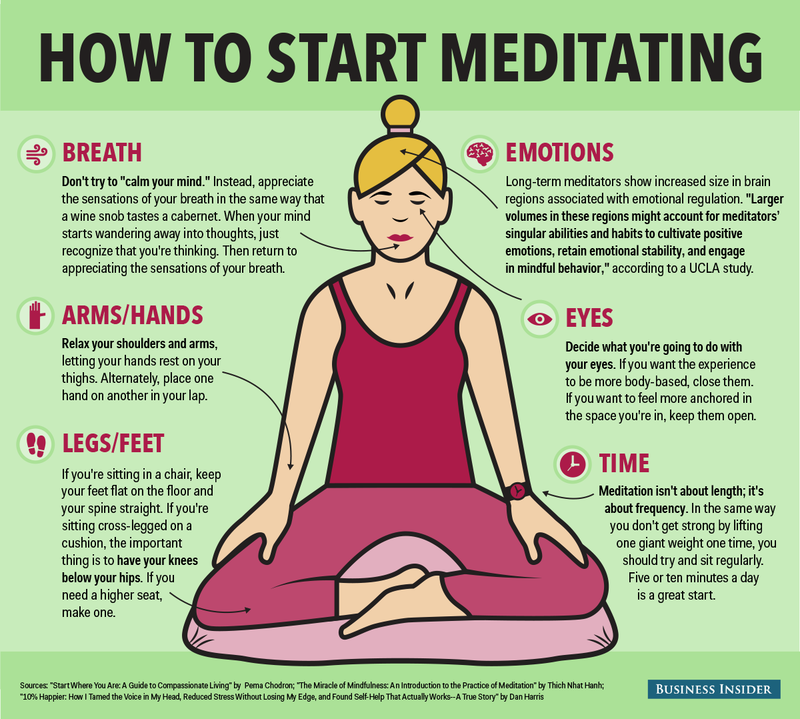 I've heard over and over, from so many different sources, that meditation is good for you. Even WebMD has an article about the health benefits meditation provides. But both Mr. Volk and Mr. White heartily recommended meditating, so I decided that if it can help me lucid dream AND do magic, it's worth starting a meditation practice. Since you get what you measure, I downloaded a free app called Logster, so that I can keep track of my meditation; specifically, how many minutes per day I meditate. I'm hoping to keep myself on track by doing this. My goal for now is 10 minutes/day, eventually getting up to 20 minutes/day. Is it ironic that I got this graphic from Business Insider? Second, the importance of doing. I'm sure that sounds basic to a lot of people, but I have a tendency to read and study and think about things without ever getting into the meat of trying things. What's the point of learning if you don't act on what you've learned? (Assuming you think it's worth acting on, of course.) In other words, I procrastinate too much, and I'm trying to be less lazy. A worthy personal goal, wouldn't you agree? Hence the meditation - putting into practice what I've been reading about. Third, the interplay between the conscious and subconscious mind. I'm going to do more reading on this because one of the topics in Fringe-ology that I found really fascinating was the idea of Consciousness. What is it, and where does it come from? Is it the result of a series of electrical impulses in the brain? Or does it arise from something deeper than that? I'm also fascinated with the idea of the subconscious mind, and the potential it holds. I want to lucid dream so I can interact with my subconscious, and if possible, I want to tap into its creative power. Finally, human psychology in general. What makes people tick? This is the influence of my latest binge watching; Mr. Jane makes me want to know more about people's motives. It's also the case that I'm someone who considers herself a writer, at least on some level, yet I don't feel that I understand people well, which makes for poor character development in my fiction as well as less effective personal communication in my own life. And in between reading, meditation sessions, and episodes of The Mentalist, I'm hoping to come up with a great idea for a book. Please feel free to leave a comment and share your experience with any of these topics, since I'm always interested in hearing other people's stories! 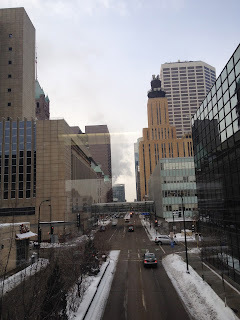 I'm back in Minnesota, and having had the opportunity to wander around in downtown Minneapolis for an hour this morning, as I strolled from one building to another via the skyway system, I realized that I truly love it. Not just in an "omg, I love The Big Lebowski!" kind of way, either. Emotions run thick through me in certain sections of skyway; memories of people, events, and jobs, and what they meant to me, are inescapable. Some buildings calm me; others make my pulse race. It's amazing the gamut of feelings I experience merely by walking past offices, restaurants, and shoe shines. 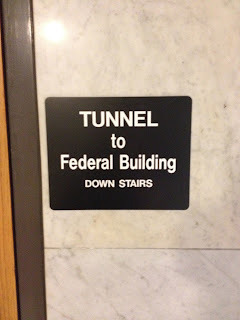 One of the coolest parts of the skyway system isn't even a skyway: it's a tunnel that runs between City Hall, the Federal Courthouse, the Grain Exchange building, and Haaf Parking Ramp. If you blink, you'll walk right past the door. It feels like a secret hidden in the lower level of City Hall. 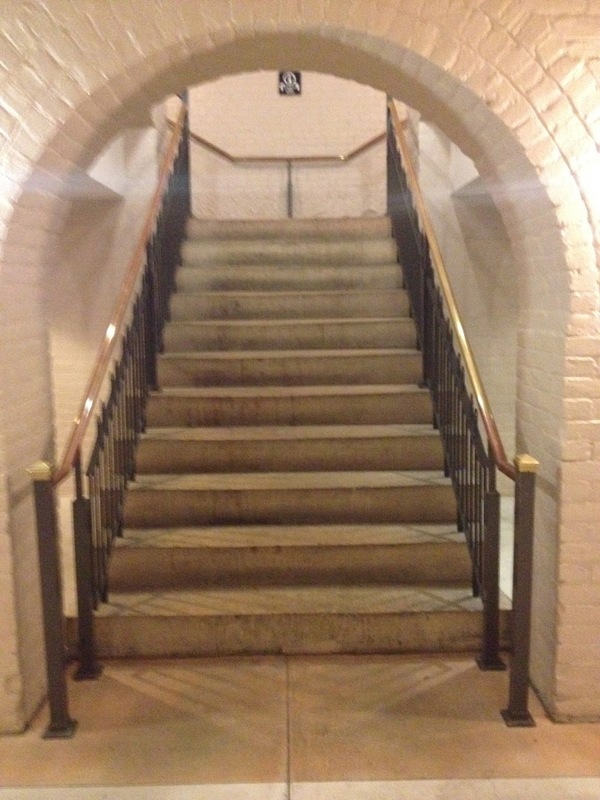 Stairway under City Hall, or Dracula's crypt entrance? Then you go down a flight of stairs and end up in what feels like a lunchroom in Purgatory: gray, hard, and empty, but with free napkins and a few vending machines. It's a strange place and feels very in-between. I have rarely seen any other person down there - and the spookiness has just begun. Is this a Kafka-esque nightmare? 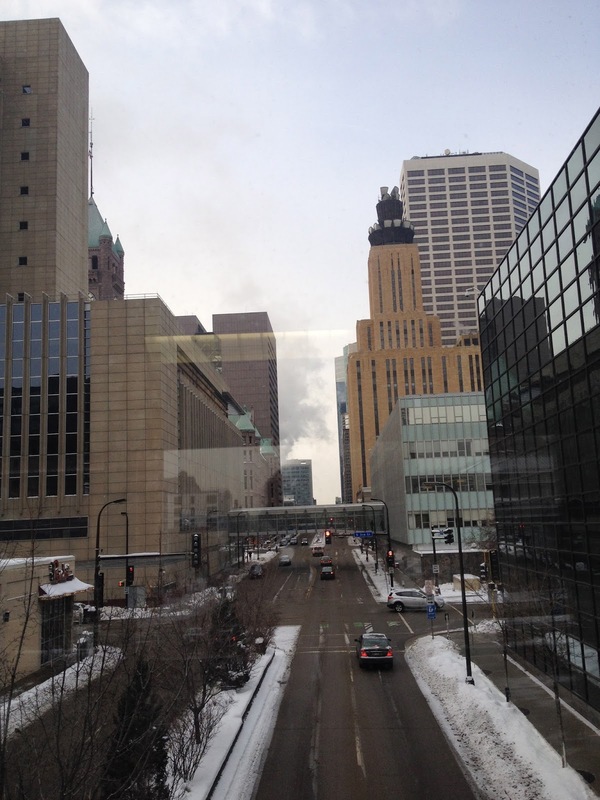 Or am I actually still underneath the city of Minneapolis? One thing is for sure: it's super creepy. Other people are few and far between. The farther I get, the faster I walk, as the terror begins to set in. 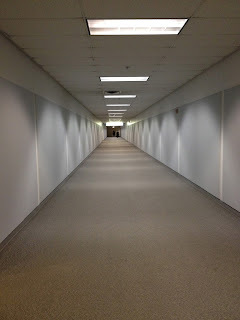 If you like feeling as if you're in a slasher flick or wish you could have been in The Shining, head down there ASAP. 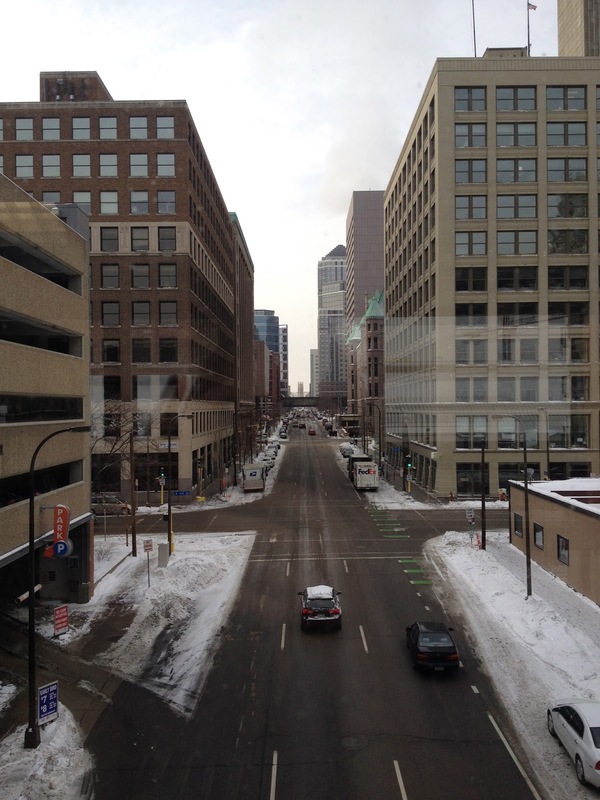 But my favorite chunk of skyway is a crossing over 3rd Avenue, between 3rd Street and Washington Avenue. 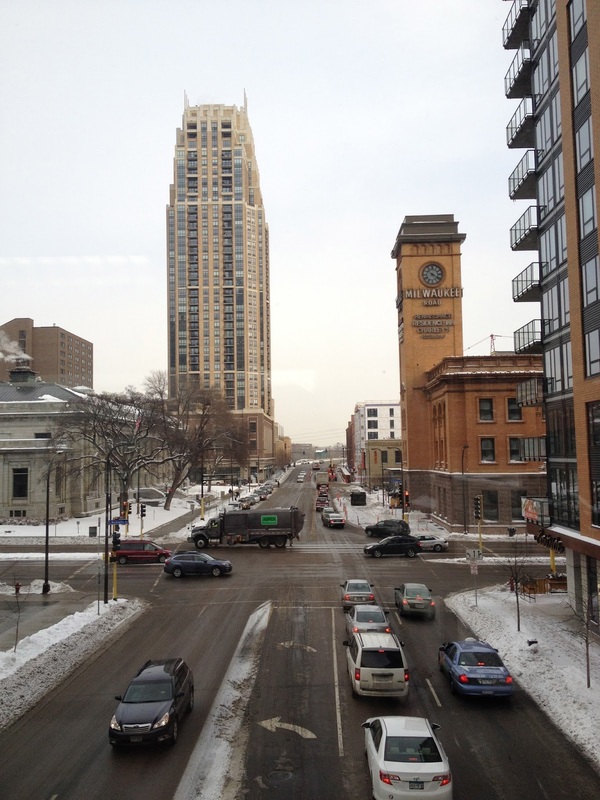 It's between a quiet and usually empty Wells Fargo operations building (very calming - the HVAC system makes great white noise) and the new Parallel 45 building (and, on street level, Lickety Split and Rick's Cabaret). One reason I like it so much is that it seems largely unused; the eastern end of the Skyway system is much less populated than on Nicollet or around the IDS Center, and it's between two buildings that don't see much action, so passers-by are infrequent. It's the only public space I've found downtown that gives me a sense of quiet privacy, and I used to go there to both think and zone out during the workday. I've had many contemplative moments there, looking out towards the 3rd Avenue bridge and Northeast Minneapolis. I'm not sure what it says about my psychology that I love what are essentially huge hallways. 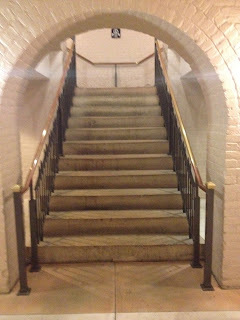 The symbolism of a series of hallways speaks to a search for meaning? The sensation of getting lost in such a maze-like web? The feeling of being at once surrounded by other people, yet ultimately alone, is the physical experience of existential nihilism? Who knows. All I know is that I love it. Waking up to the 4th day of greasy/waxy hair after my failed baking soda wash on Day 1, I said "Enough!" and decided that it was time to get serious. 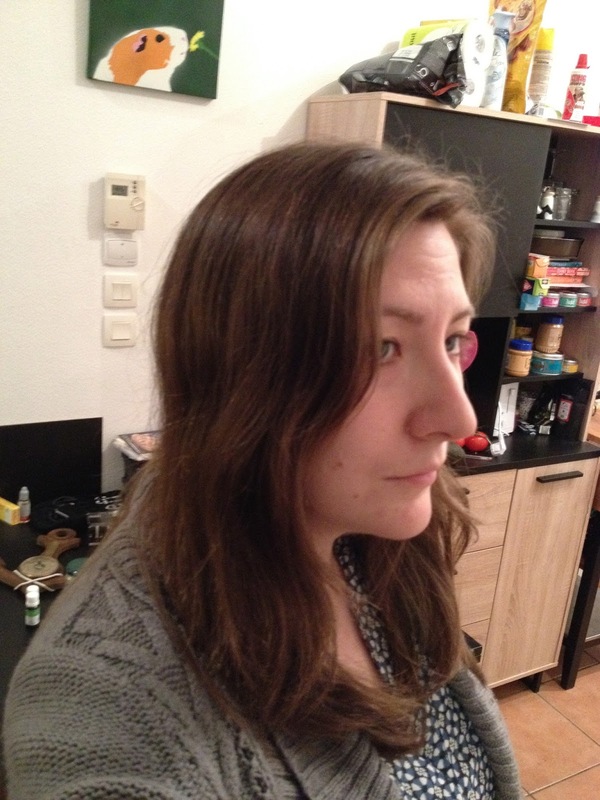 I mean, if my hair was going to stay that nasty all the time, this experiment would be over by the end of the week! Directions: Break the yolks and mix them with the lemon juice. Wet your hair and apply the egg and juice mixture; massage it on your scalp and through your hair; let sit for 10 minutes. Rinse out with cold water. Pour a 1/2 cup of white vinegar and 1/2 cup of water over your head; let sit for 1 minute and rinse out with cold water. Allow to air dry. I followed the recipe for the most part, except I used 3 egg yolks because 1) we happened to have 3 eggs left, and who eats just one egg, and 2) I was really paranoid about getting my hair clean, so the extra egg felt like it would have more "oomph." I also didn't have lemon juice so I added a little bit of water instead and mixed it up. I followed the rest of the directions exactly - standing wet and chilly in the shower for 10 minutes was not the highlight of my day - and towel-dried my hair until it wasn't dripping anymore. Now that my hair is dry, I can happily say this was a complete SUCCESS!! 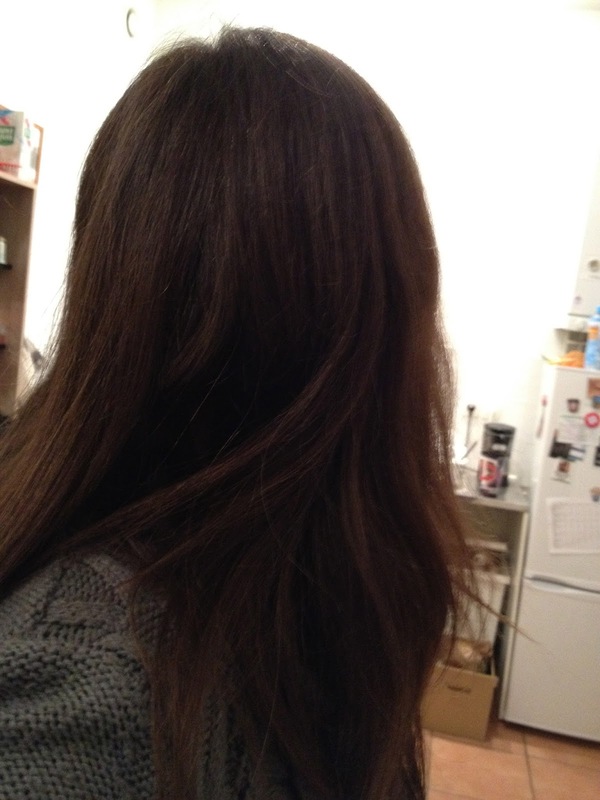 My hair is clean, so gloriously clean, that I just want to kiss it. It's also soft and smooth. I have read in a couple of places that hair can "overdose on the protein" in egg washes, so apparently it's not a good idea to use it too often, but it will definitely be a permanent fixture in my hair-care arsenal. So fresh and so clean! clean! Inventor of the luxury guinea pig industry, wishful thinker, and usual suspect. Follow me on Twitter @lucyloveschachi.